You can't have bragging rights from a Denver vacation until you see these sights. Warning: it may take more than one visit! Here are some of Denver's Mile High Must-Sees, arranged by location. The Brookings Institution ranks Denver as the fourth most walkable downtown in the nation. You can save on shoe-leather by riding the free shuttle bus on the 16th Street Mall – it makes everything downtown easy to reach. Stand exactly 5,280 feet above sea level (one mile high!) on the west steps of the Colorado State Capitol, then climb to the rotunda for a panorama of snowcapped peaks. It is against state law to block the view of the 200 named mountains visible from the dome. Free tours are available on weekdays. The Denver Art Museum is made up of two architecturally stunning buildings – one a fortress-like structure from Italian architect Gio Ponti, the other, a structure that resembles a titanium crystal with peaks and shards designed by Daniel Libeskind. Inside, find the world&apos;s greatest collection of Native American art and 68,000 other art objects, including works from European masters, Old West classics and phenomenal traveling exhibits. Welcome to the Wild West! Buffalo Bill Cody&apos;s exciting story as Pony Express rider, army scout, buffalo hunter and showman comes to life at the Buffalo Bill Museum & Grave, high atop Lookout Mountain. Enjoy views of the snowcapped Rockies in one direction, the Great Plains in the other. For those with strong nerves, drive to the museum on the hairpin Lariat Loop Drive ... then continue to I-70, exit 250, to see a live herd of buffalo. Surrounded by towering Western buttes, the Colorado Railroad Museum combines a spectacular location with more than 100 narrow and standard gauge locomotives, cabooses and cars. Exhibits include a working Roundhouse, model railroads, photographs and artifacts, much of it housed in a replica of an 1880s-style depot. Train rides every Saturday on the Galloping Goose take guests on a third of mile loop of track, while "Steam ups" and special events including "A Day Out With Thomas" occur throughout the year. Clyfford Still, considered one of the most important painters of the 20th century, was among the first generation of Abstract Expressionist artists. The Clyfford Still Museum, which opened at the end of 2011, was founded to promote the late artist&apos;s work and legacy. Still&apos;s estate - 2,400 artworks - has been sealed off from the public since 1980. Learn how to make money! The U.S. Mint can produce more than 50 million coins a day, each one stamped with a little "D" for Denver. Free guided tours show every step in the process of turning a dull, blank, metal slug into shiny pocket change. Same-day tickets available starting at 7 a.m.; no advance reservations. The History Colorado Center, one of Denver’s newest cultural attractions, is designed to ignite imaginations of all ages about Colorado history through high-tech and hands-on exhibits, programs for children and adults, and special events. The Colorado Convention Center is home to “I See What You Mean,” AKA the giant Blue Bear that peers into the Center’s interior. Created by Colorado-based artist Lawrence Argent, the curious blue bear stands 40 feet tall – you can walk under it and get a great photo. Lined with 200 trees and 50,000 flowers, this festive, mile-long 16th Street Mall has 28 outdoor cafes and offers Denver&apos;s best people-watching. Renowned architect I.M. Pei designed the gray and pink granite pathway to resemble the pattern of a diamondback rattlesnake. Hop on the bus – they&apos;re free and stop on every corner. After dark, horse-drawn carriages clatter up and down the Mall. Larimer St., between 14th and 15th Sts. Larimer Square is a trendy block of Victorian buildings is home to chic shopping, dance clubs, a comedy club, outdoor cafes and a dozen of Denver&apos;s best restaurants. For 40 years in downtown Denver, it&apos;s hip to be at the "Square." Denver&apos;s happening historic district is filled with turn-of-the-century warehouses, now home to 90 brewpubs, sports bars, restaurants and rooftop cafes. While you&apos;re in LoDo, stop by Rockmount Ranchwear for a snap button Western shirt at the store where they were invented; browse from 6:30 a.m. to 9 p.m. at the Tattered Cover Bookstore; listen to jazz at El Chapultepec, one of Esquire Magazine&apos;s 50 best bars; or sip a handcrafted beer at the Wynkoop Brewing Company, Denver&apos;s first brewpub opened by former Denver Mayor (now Colorado Governor), John Hickenlooper. Denver&apos;s Union Station has undergone a massive restoration that transformed the landmark into a transportation, dining, shopping and entertainment hub and hotel. The historic, Beaux Arts 1914 train terminal is now a foodie destination, with a dozen restaurants and bars, from farm-to-table favorite Mercantile to the Terminal Bar, situated in the station&apos;s old ticket windows. A handful of local retailers includes a branch of the popular Tattered Cover Bookstore. Union Station is also fulfilling its original role as a major ground transportation hub, serving as an AMTRAK, light rail and shuttle bus station with direct rail service to Denver International Airport. Denver was founded at Confluence Park as a gold mining camp in 1858. Today, the river park is the heart of Denver&apos;s 85-mile bike trail network, and is surrounded by attractions. Ride the Platte River Trolley to the Downtown Aquarium to see stingrays and sharks and The Children&apos;s Museum of Denver, with dozens of interactive "playscapes" for younger kids; eat and drink in the nearby neighborhoods of Riverfront, LoHi and Highlands. The only downtown theme park in America is really two parks in one: on one side of Elitch Gardens Theme & Water Park, experience 53 thrill rides, including looping roller coasters; on the other side, cool off in a wet &apos;n&apos; wild water park with tubes waterslides and wave pools. The park is open from early May to early November. City Park, Denver&apos;s largest park, has several lakes, spectacular mountain views, a public golf course, flower gardens and a hiking/jogging trail that is exactly one mile high. From stunning prehistoric fossils to an exploration of outer space, The Denver Museum of Nature & Science never fails to astound and amaze with realistic visions of the past, present and future. The Gates Planetarium is one of the most sophisticated planetariums in the country, giving visitors unparalleled insight into the workings of the cosmos, and the Phipps IMAX Theater features brilliantly filmed IMAX entertainment. Lions and tigers and bears – and so much more, on lovely grounds make the Denver Zoo one of the most popular zoos in America. Go underwater with polar bears at Northern Shores, or eyeball-to-eyeball with a gorilla in Primate Panorama. Predator Ridge recreates the plains of Africa with a pride of lions, while Tropical Discovery is rainforest teeming with crocodiles and gila monsters. The tree-shaded Cherry Creek neighborhood is just two miles from downtown and easily accessible by bike on the Cherry Creek Bike Path. More than 500 department stores, boutiques, galleries, spas, and one-of-a-kind shops grace this browsing paradise – the largest concentration of stores between St. Louis and San Francisco.Cherry Creek Shopping Center is an ultra upscale mall with Neiman Marcus, Nordstrom and Tiffany&apos;s, while across 1st Ave., Cherry Creek North offers tree-line streets with cafes, spas and galleries amidst fountains and public art. Denver Botanic Gardens, a 23-acre oasis in the middle of the city, has 45 different gardens (some 33,000 plants), as well as one of the nation&apos;s top 10 conservatories. Relax in the Japanese Garden, climb through the Rock Alpine Garden and explore the new Mordecai Children&apos;s Garden. The Boettcher Memorial Tropical Conservatory is the largest single structure tropical conservatory in the U.S., including banyan tree roots and cloud forest orchids. Golden, Colorado&apos;s first capital, celebrates its Old West history and mountain location with a trendy downtown filled with galleries and recreation shops. Sip a beer at an outdoor café, while kayakers float by on fast rushing Clear Creek. Carved from towering red rock monuments, Red Rocks Park & Amphitheatre is one of the world&apos;s most renowned concert venues and has hosted everyone from the Beatles to Bruce Springsteen. Listening to a concert here is on the "bucket list" of every true music fan. When there&apos;s no concert, the Visitor Center has a free museum and Performers&apos; Hall of Fame, while the surrounding park has hiking trails that weave in, around and over the colorful red rocks. "Taste the Rockies!" Coors Brewery, the world&apos;s largest brewing site still uses the same Rocky Mountain spring water that Adolph Coors discovered in 1873. Free, self-guided tours show every step in the brewing process, and end with free samples for those over 21. These two old gold mining towns (once known as the "Richest Square Mile on Earth") have come alive with casino gambling. Central City and Black Hawk offer two dozen casinos rock 24-7 with 10,000 slot machines, poker, black jack, roulette and craps. The surrounding hills are covered with abandoned gold mines, Victorian buildings and Old West history. Every summer, the Central City Opera Association hosts a season of world-class opera. Mount Evans Scenic Byway, the highest paved road in North America, climbs 9,000 feet from Denver, passing through five life zones en route to the 14,264-foot high summit. This is one of Colorado&apos;s 54 fourteeners (peaks that climb to 14,000 feet and above), and one of only two in the nation that you can drive up. Stop at Echo Lake along the way for hiking trails, fishing, picnic tables and an unusual eight-sided log cabin restaurant. At timberline, Denver Botanic Gardens maintains a trail that winds through wildflowers. Due to snow, the Mount Evans Highway is generally open to the top only between Memorial Day and Labor Day. Home to the University of Colorado, Boulder has been described as the "the city nestled between the mountains and reality." A recent study pegged it as the "happiest" city in America. You&apos;ll find out why when you stroll past the shops, cafes and street performers on the Pearl Street Mall, or take a hike on the city&apos;s 200 miles of trails. Nearby attractions include the National Center for Atmospheric Research with a museum on weather and global warming, and towering Eldorado Canyon State Park, one of the most famous technical climbing centers in America. Colorado&apos;s No. 1 attraction, Rocky Mountain National Park, offers an unforgettable trip into the heart of the Rocky Mountains. More than 350 miles of trails meander to valleys of wildflowers, thundering waterfalls, high alpine lakes and craggy, snowcapped peaks. Trail Ridge Road is the highest continuous highway in the world with panoramic views in all directions. See elk, moose and big horn sheep, while hawks and eagles circle overhead. National Geographic named Rocky Mountain National Park one of the top trips in the world in 2014. At the entrance to the park, the historic resort village of Estes Park offers shopping and dining. See what sets Denver apart like 7 professional sports teams, 300 days of sunshine, 200+ parks and easy mountain access. Denver's burgeoning food scene is filled with must-try restaurants, quaint neighborhoods bustling culinary scenes, and brewery tours with tastings. The Mile High City is crazy for sports, and it's not all about the Broncos. 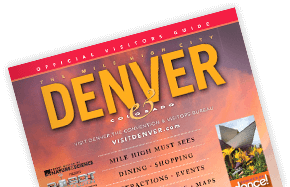 Discover some of Denver's Mile High Must-Sees, arranged by location.